Wasps and Leicester are currently going at it in round 3 of the Gallagher Premiership at the Ricoh Arena, with the home side 19-5 at the time of writing thanks to a try each from Juan De Jongh, Josh Bassett and Nathan Hughes. Bassett finished Wasps’ second try beautifully thanks to a inch-perfect kick from England international Elliot Daly, and also had a big hand in the first, albeit through some strange circumstances. With Wasps looking to clear their lines Elliot Daly launched a kick towards Leicester’s half. Fullback Telusa Veainu did his best to charge down the effort, but ended up taking the clearance kick flush into the face. 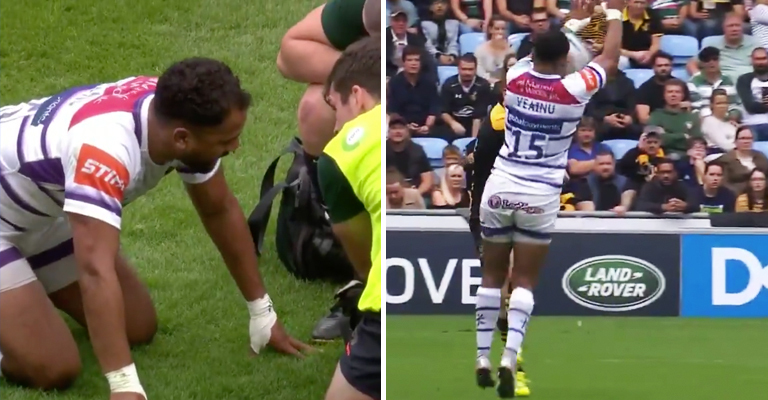 Bassett then gathered the loose ball and charged down the pitch with no Veainu to cover back, resulting in Wasps’ first score. Crazy scenes altogether. So unfortunate.